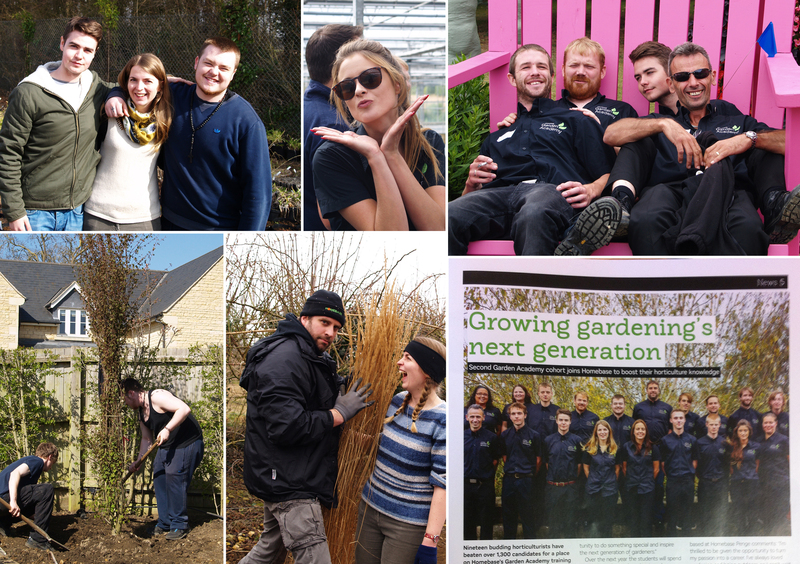 My final post about the Garden Academy. Reflecting on the amazing year with have had – lots of highs, very few lows and plenty of silly photos. 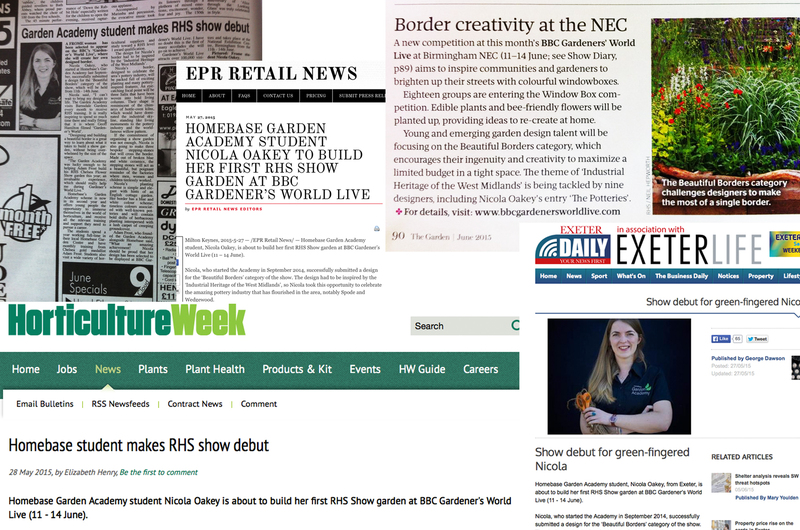 Our last week of supplier visits with the Garden Academy. Our crazy, amazing year is coming to an end! Read the part two of our July visits here. 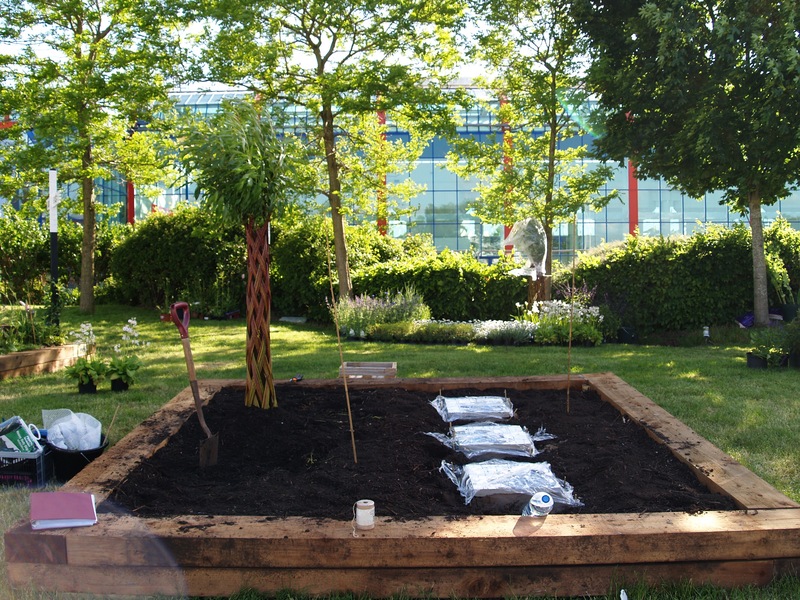 Click here to read the first installment of where the Garden Academy visited in July. 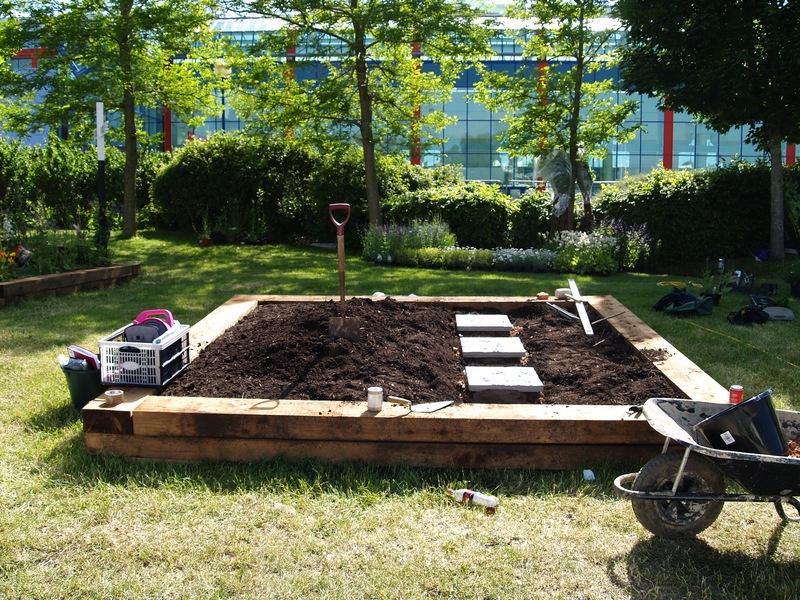 Click here to read all abut what the Homebase Garden Academy have been doing over the last month. A couple of hours up the motorway and I was united with my border. It’s funny that I have spent the last month or two thinking and organising my 3×3 meters plot, yet I could not quite imagine what it would look like until I arrived. It definitely feels a lot bigger than just 3×3 meters and I did not realise it was going to slope quite so much, however once filled with plants it will be a lot less noticeable. Plus, I’m hoping the gradient might work in my favor, giving more height and depth. 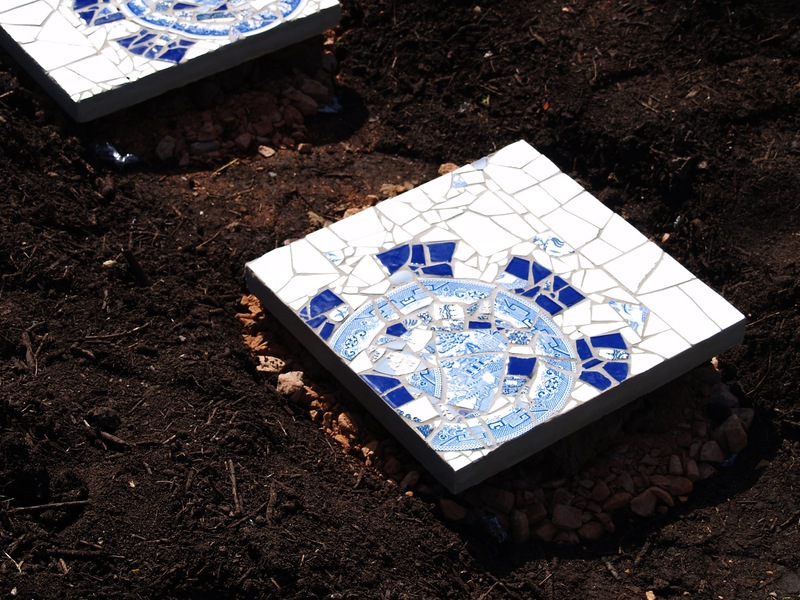 The first thing that had to be positioned were the stepping-stones, once they had been laid I was able to play around with where to put the three willows. I really wanted to get them planted by the end of the day, so that I can look at them with fresh eyes tomorrow morning and make sure they really are in the right places. Representing the chimneys of bottle oven kilns, I hope that the way I’ve staggered them will echo the many layers of kilns that would have once dominated the West Midlands’ skyline. The balls of foliage should hopefully provide some light shade, meaning I can have a bigger variety of plants in the border. It was good to see the plants again today, even though I only last saw them on Friday! I had been worrying about whether I had made the right choices over the weekend. However, by the time I had unloaded them all off the trolleys and placed them in the shade, I thought they looked like they might work well together. I’m really excited about making a start on the planting tomorrow. It is a little terrifying that I don’t have a concrete plan to work from, but I’m excited to see what I can create. I cannot start work on my Beautiful Border soon enough. Even though a large part of me just wants to be at home in sunny Somerset and celebrate my first sweet pea flowers opening, if I worry about how I’m going to place my plants for many more days I will be grey-haired by the time the show opens. I’ve been appearing here, there and everywhere. 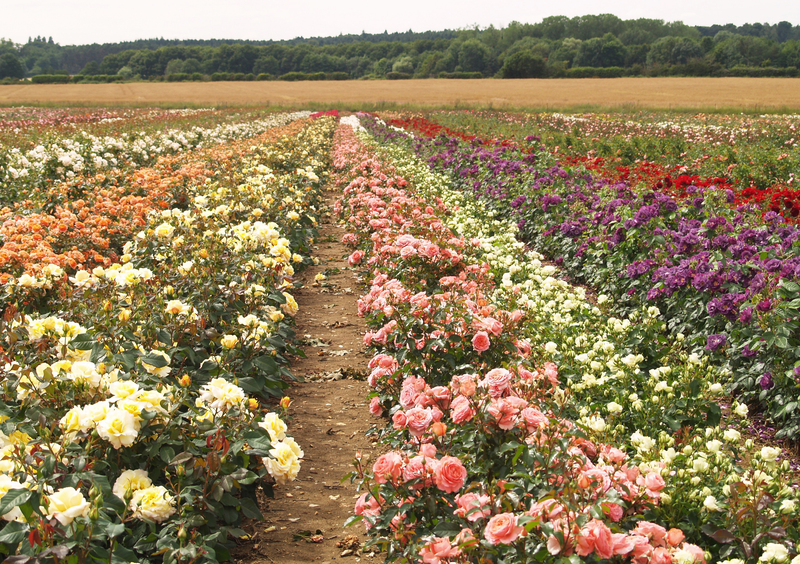 Yesterday I visited New Forest nursery to select the plants I will be using in the border. Everyone was hugely helpful and even more patient as I wondered back and forth between row upon row of plants, trying to make firm decisions. 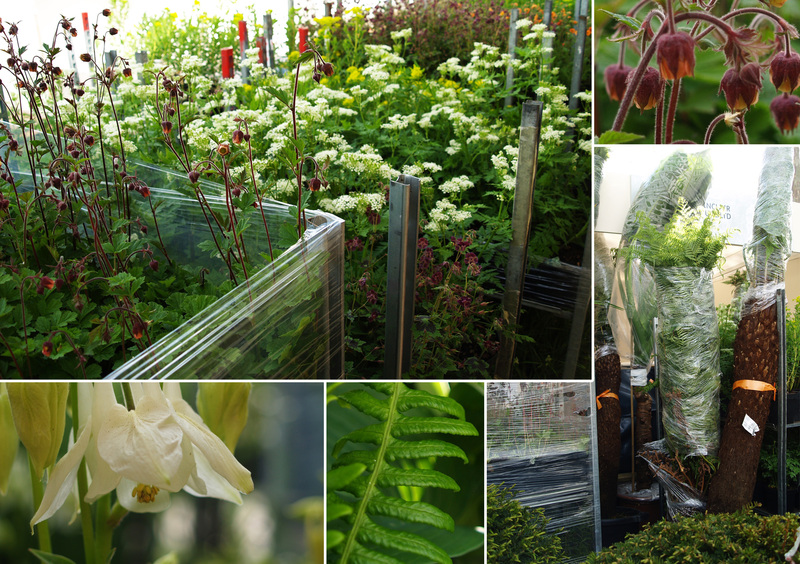 I am really happy that the plants are now sorted and I have got some beautiful things, but it was hard. There was no one there to hold my hand and it felt weird that I just had to make my mind up. So, having previously spent my time worrying about not having any plants, I am now worrying about the plants I do have and I am feeling a bit embarrassed. 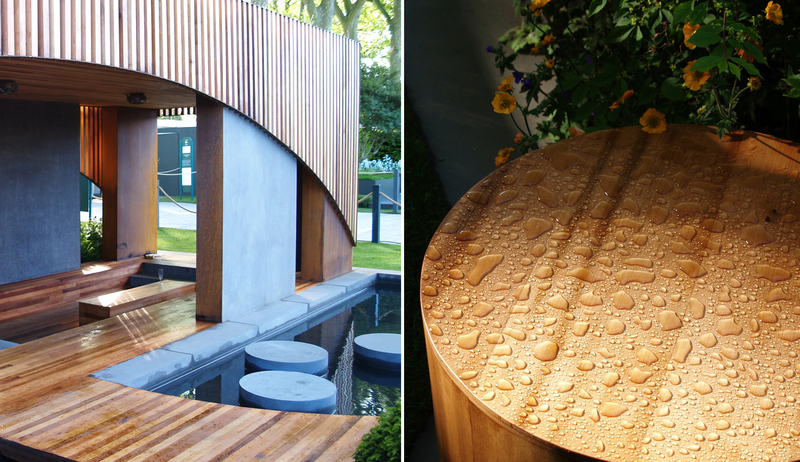 Is a public show really the best place to bring my first ever planting design to life? I should have probably done something behind closed doors first, with out prowling TV presenters and judges with clipboards to look at what I’m doing. 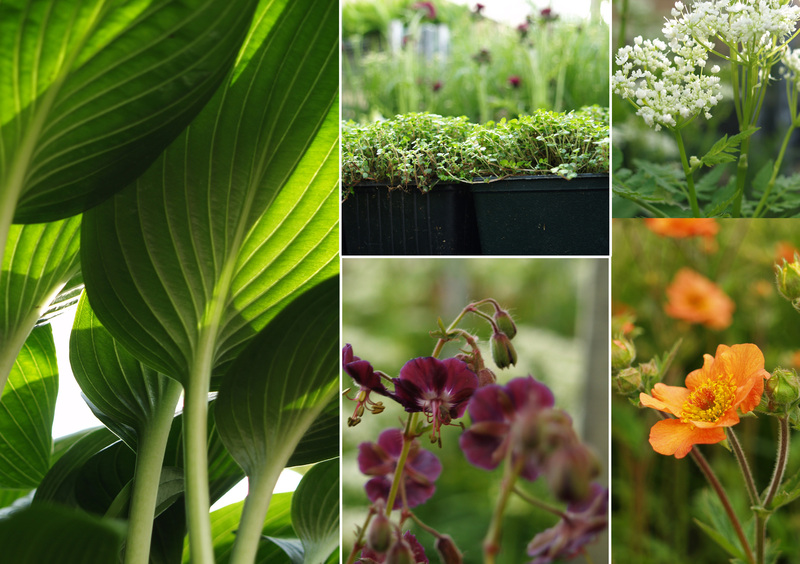 I have plenty of books about planting design and I have spent far too many hours adding hundreds of garden photos to my Pinterest account, but nothing compares with practice and experience. 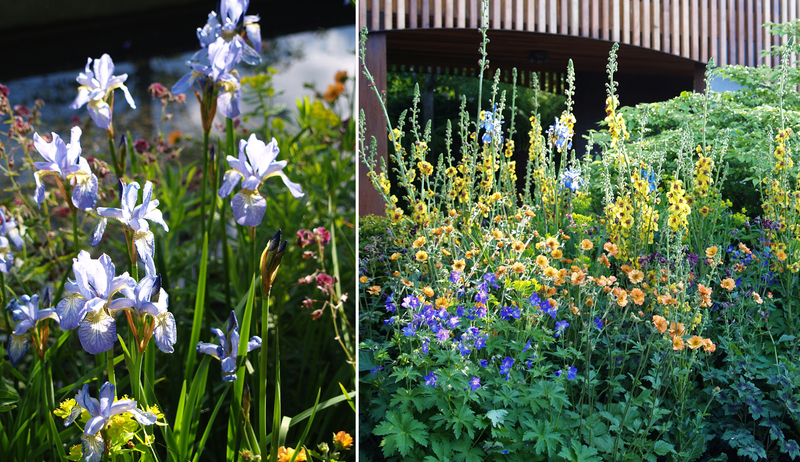 Trying to think a bit more positively, if I can, for want of a better phrase, ‘pull it off’, then it hopefully proves that anyone who wants to have a go at designing his or her own border absolutely must give it a try. However, unless they want some added pressure, maybe in the familiar surroundings of their own home first. 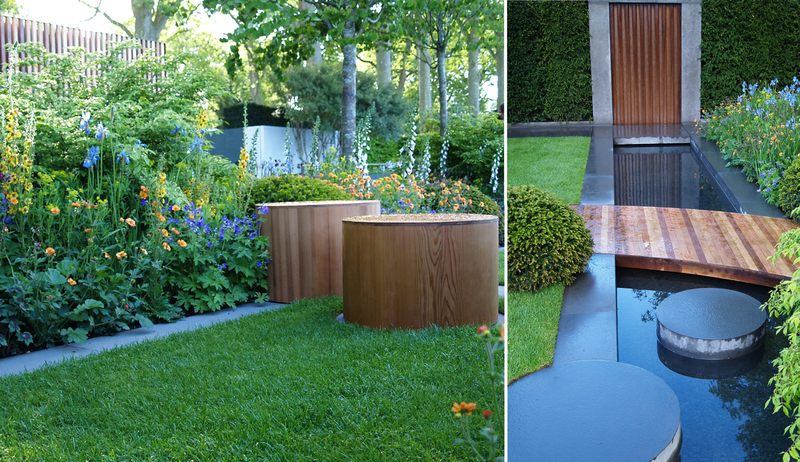 Now that the Chelsea Flower Show is over, it is sad to think that photos are the only means we have to revisit so many beautiful gardens. I hope I have taken enough to remember all of the little details that intrigued and fascinated me, especially in our garden. The texture of intense green leaves again the coarse rusty steel. 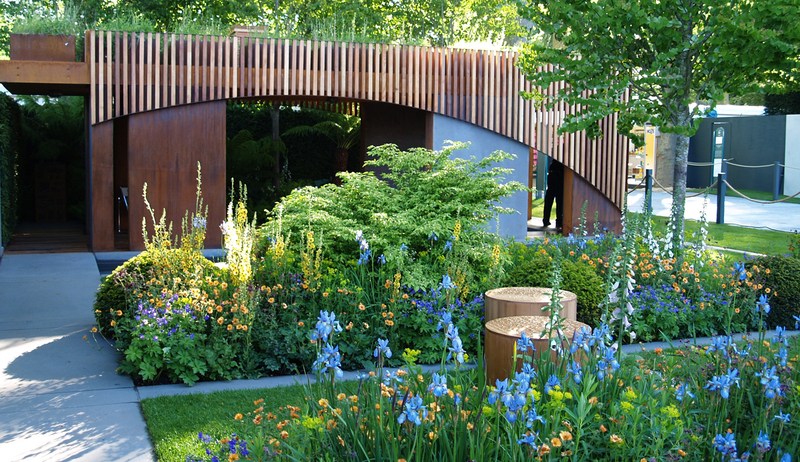 The contrast of shapes throughout the garden; bold collections of circles sitting within linear boundaries of concrete and the way the building perfectly framed the jungle-planting behind. Watching bees appear from nowhere and make the garden their temporary home, and the spicy, sweet smell of cedar. One benefit is that I can spend as long as I want looking at each photo, studying the layers of planting or the sun through the petals of the Iris. 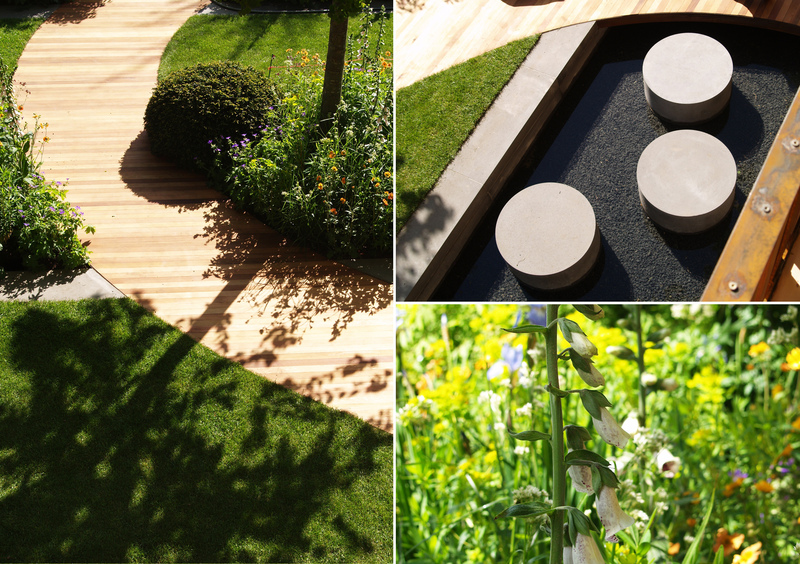 They flatten the busy real-life scene into a one-layered image and really allow the garden to be fully appreciated as a whole. 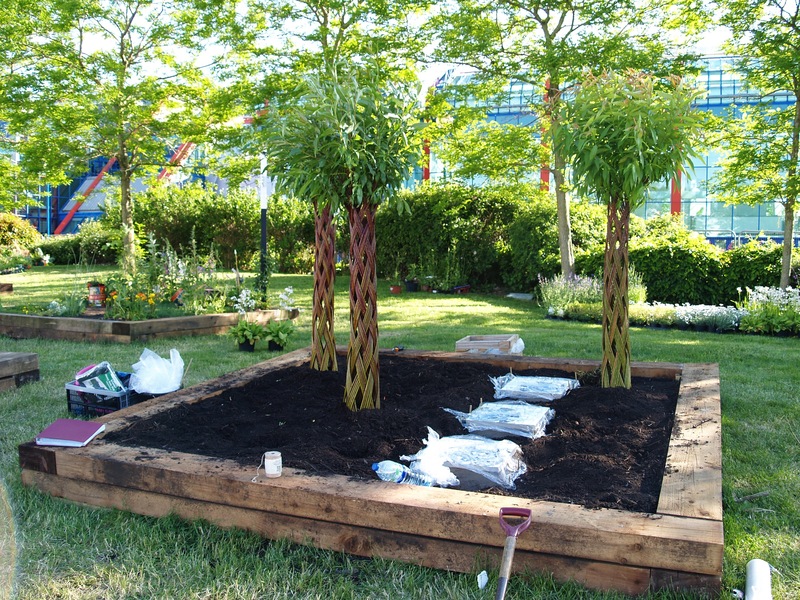 I returned to the RHS Chelsea Flower Show last week to experience four days of planting. The garden had altered dramatically since I was last at SW3, even though I had only been away for a couple of days! A fortress of plant trolleys guarded the developing design. Two-deep and surrounding the two open sides of the garden, uniformed rows of solider-like plants were ready and waiting to create wildlife friendly borders. 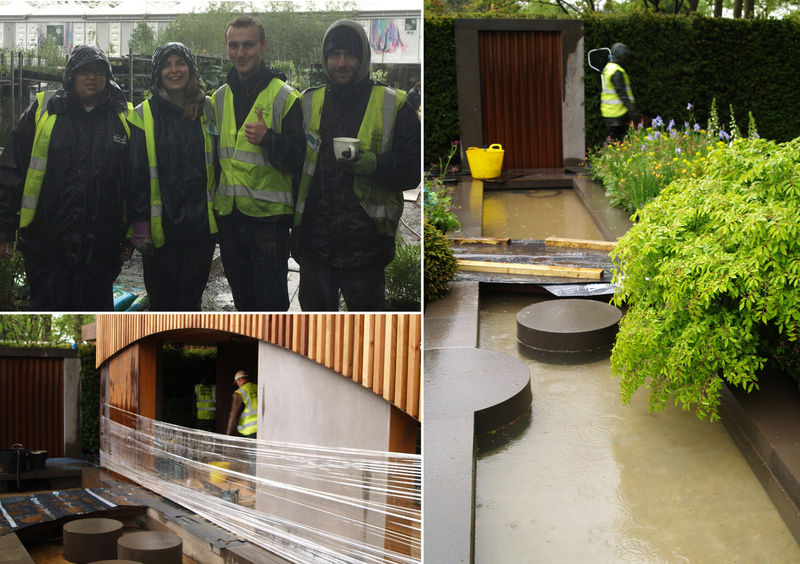 Come rain or shine a small team of people worked tirelessly to recreate Adam’s vision of the planting. To begin with I found it hard to imagine how the completed scheme would look, but suddenly the puzzle pieces all locked together and the drifts of tall spires naturally flowed between borders. 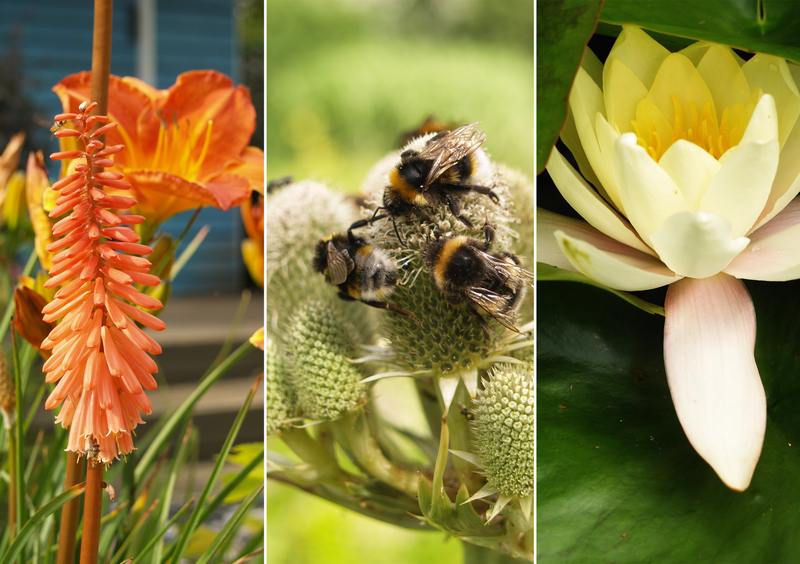 The bees began taking full advantage of the beautiful blooms, especially the nodding bonnets of the Aquilegia and the striking bursts of orange Geums. 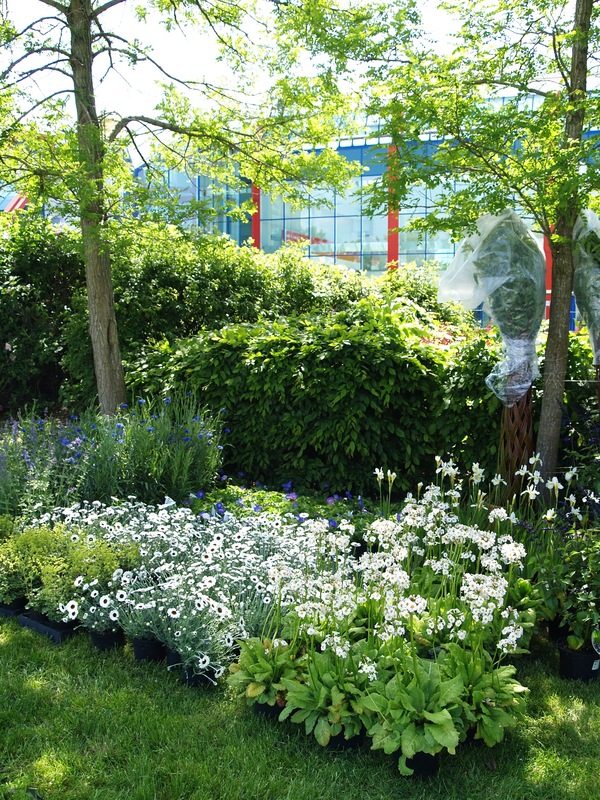 The garden has three distinct areas of planting. 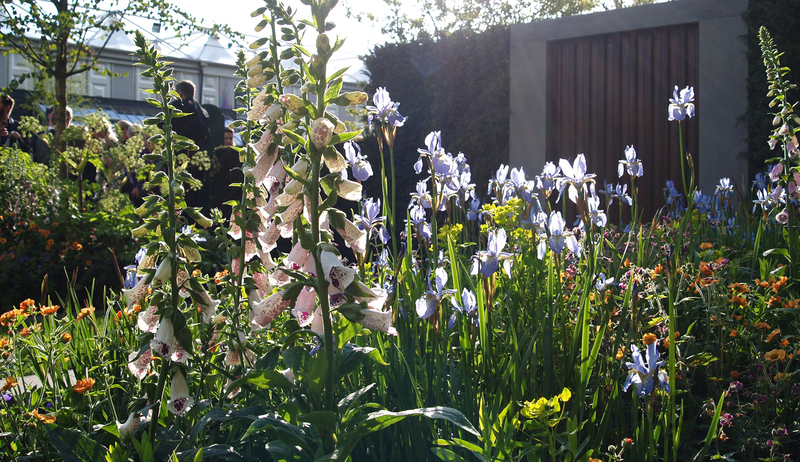 At the front of the garden three long rectangular beds overflow with bright, soft herbaceous plants. 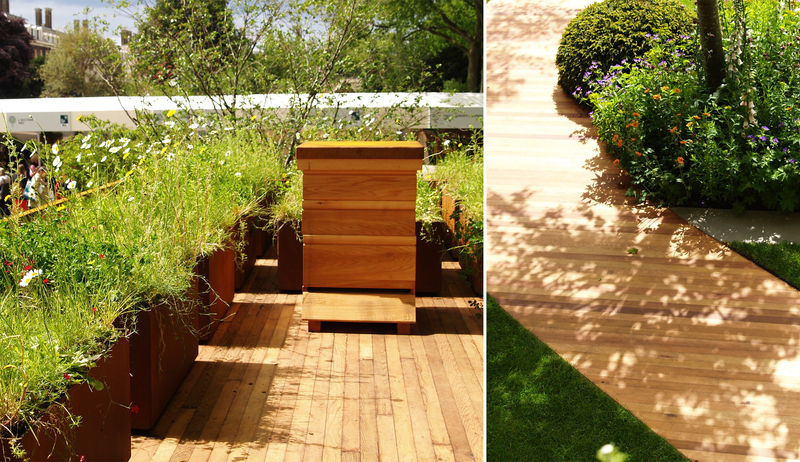 On the roof of the architectural Bauhaus building square corten planters are filled with wildflower turf, a perfect place for a cedar-wood beehive. 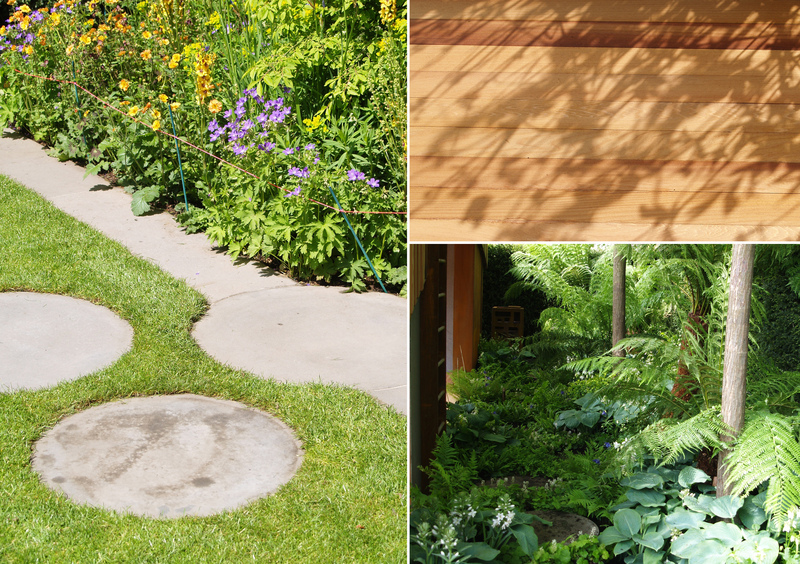 Finally, at the back of garden is the jungle, where lush Tree Ferns, Hostas and Euphorbias weave their way between smooth concrete stepping-stones. I love this secret area, which takes complete advantage of a shady aspect enclosed by tall Yew hedges. 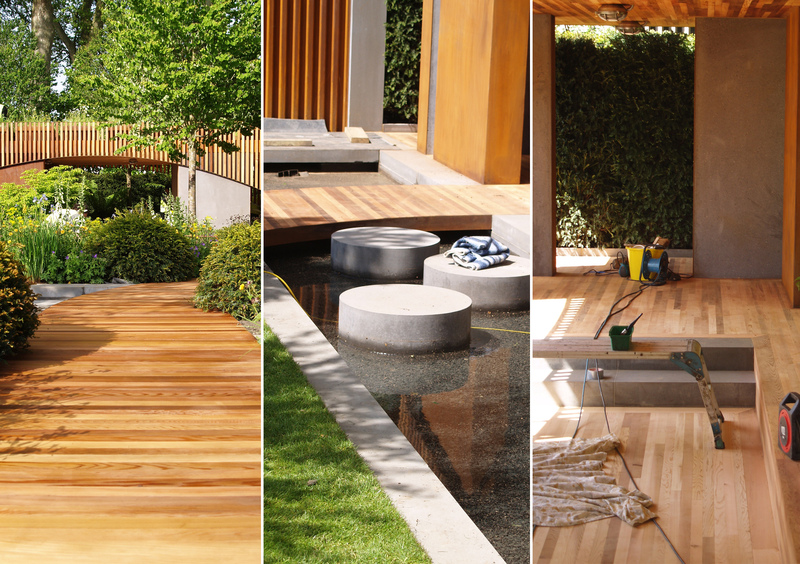 As the design drew closer to completion we had to dance our way around the garden (and one another) trying not to get the concrete or cedar dirty. Our efforts at trying to keep the walkways clean and mud-free were dampened on Thursday, when torrential rain poured down on the show ground all day. Cups of tea became hand warmers, as well as fuel to keep us going and I realised how lucky we have been to have so many dry days. The areas of turf were one of the last things to be completed. All the Chelsea gardens have pristine lawns, which are laid around the perimeter of the design, like putting a frame around a painting. Although, I have noticed that Adam’s garden is one of the only ones on Main Avenue to have a ‘proper’ lawn included with in the design. Perhaps lawns are not very fashionable anymore, however there is nothing nicer than spreading a blanket on the grass on a hot day and lying in the sun. The fresh blades of grass are like the punctuation between the overflowing borders and the crisp pools of water and I think they both soften and accentuate the framework of concrete copings. 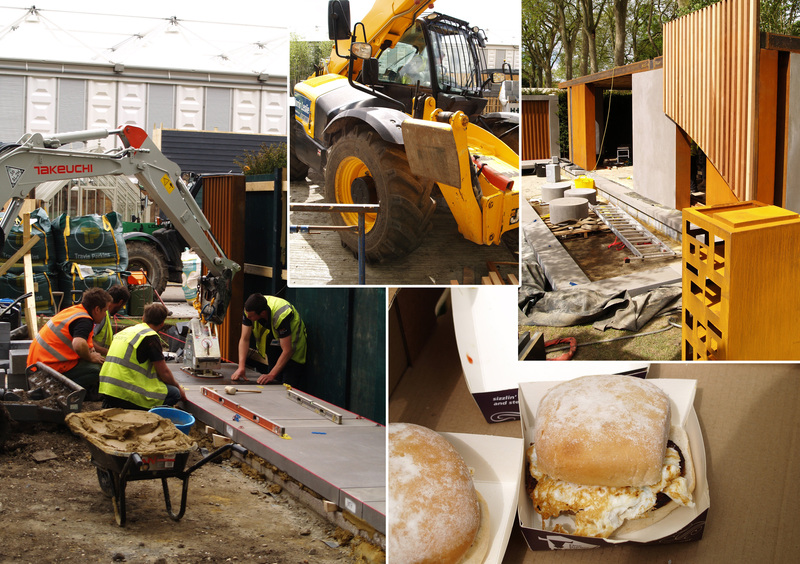 I have spent over 130 hours on site, with a diet consisting mostly of tea and takeaways. 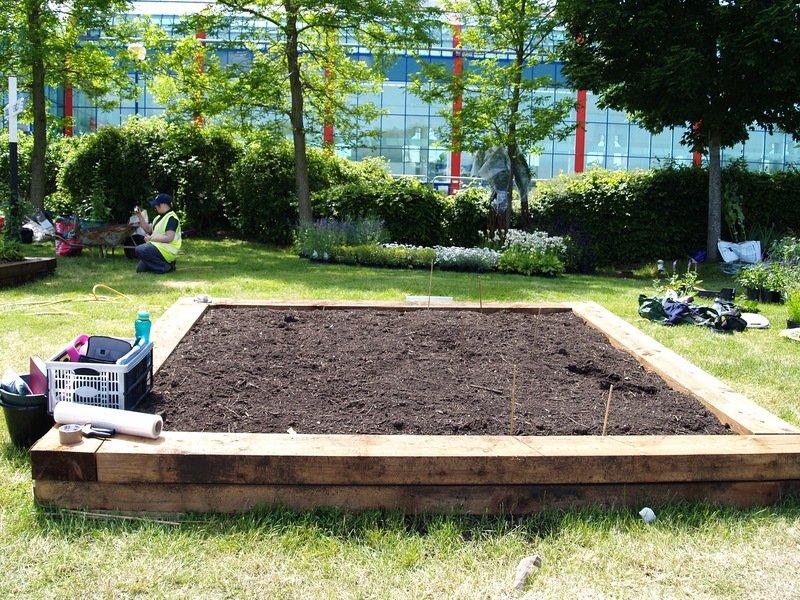 I knew that I would learn lots of new skills, especially having never experienced a garden being constructed before. Although, I had no idea about the variety of different things I would get to do. There are definitely lots of less obvious things that I have gained too, including an awful lot of patience and a keen new eye for attention to detail. I have heard a lot of people saying that it is not a competition between you and your neighbour; it is a competition with yourself. They are completely right. When you are soaked through to your skin with little sleep, probably smelling pretty unattractive and covered in more dirt than just one shower will wash off, you need to dig deep and find your own momentum to keep going. I imagine it is similar to arriving at multiple film sets. Hustle and bustle, beeping lorries reversing, generators whirring, drilling, hammering, cement mixers churning, shouts and calls from every corner of the site. People dart between forklifts and diggers, as enormous trees are plucked from the ground by cranes. Somehow everyone manages to hurriedly move around and get on with his or her job with out getting in each other’s way. 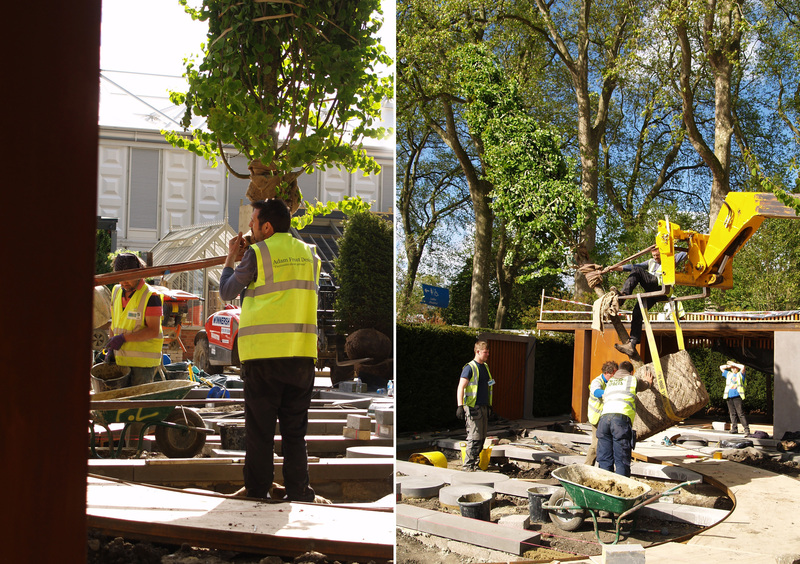 However, the swarm of builders and landscapers will not compare to the 157,000 people that will come to visit the RHS Chelsea Flower Show in just over a week’s time. 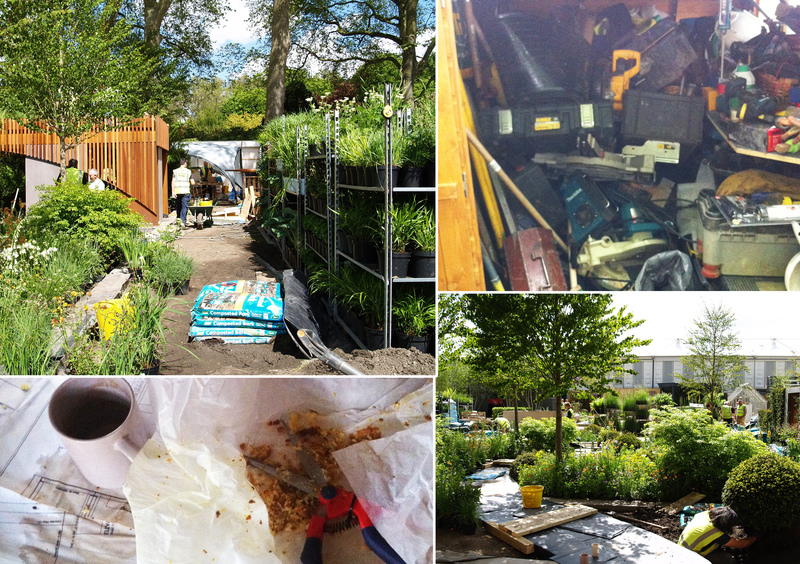 I was excited and apprehensive before joining the build of Homebase’s show garden. The eleven-hour days were more than a little daunting. 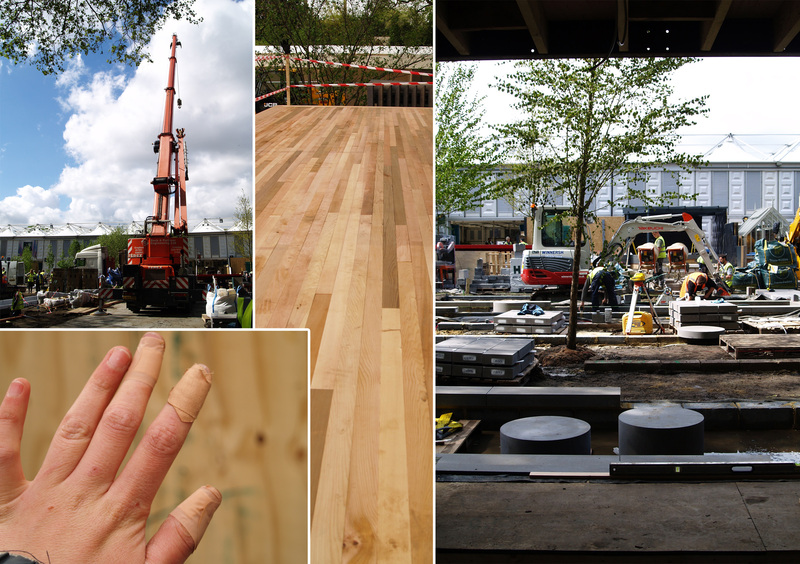 Plus, as I was joining the team less than a week into the build, I wondered whether I could deal with the physical work that would need to be done, on what I knew would be a male-orientated site. 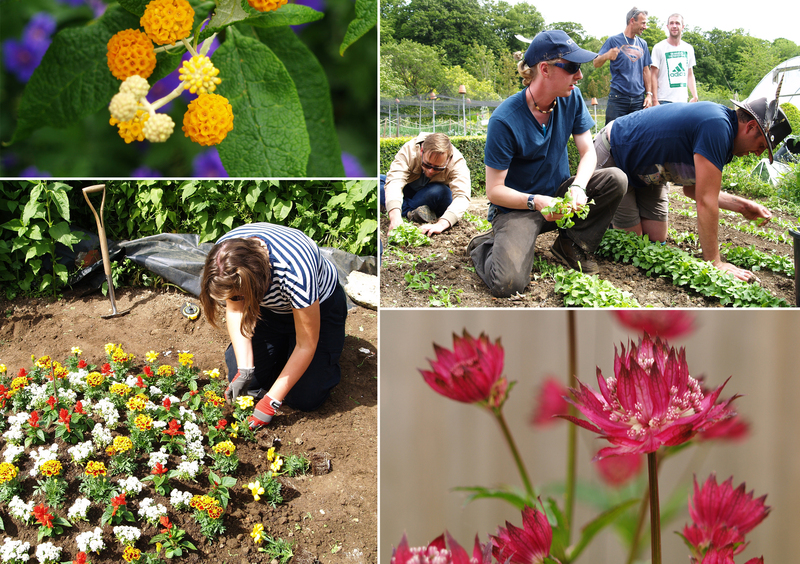 The Academy had been split up so that three or four of us would be working together on the garden at a time. It was great to see some familiar faces when I arrived at Chelsea and any initial nerves quickly vanished once I was given jobs to do. It felt peculiar to actually be working on the garden after such a long time talking about it and for the first day I was afraid to touch anything just in case I chipped, scratched, dented or damaged it. 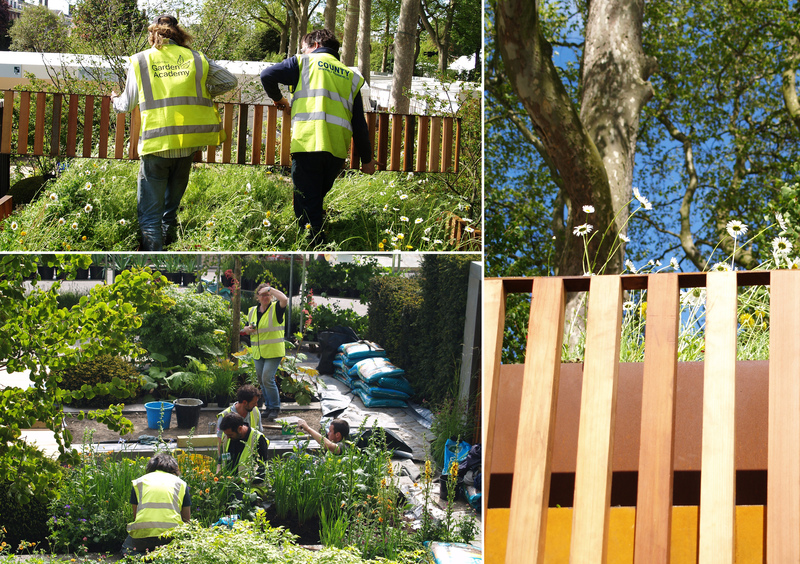 Everyday there was about a dozen of us working on different areas of the garden and at the end of each day it was incredible to see the progress that had been made. The space around the garden to store materials and use equipment was really tight, especially as the garden ‘next door’ also shared the same roadway. It amazed me that the huge forklifts and diggers were able to manoeuvre so effortlessly in such a crowded space. I did a huge variety of different tasks over the six days on site and had more responsibility than I had imagined. From receiving plant deliveries to laying flooring, I loved the variety of things I got to do. 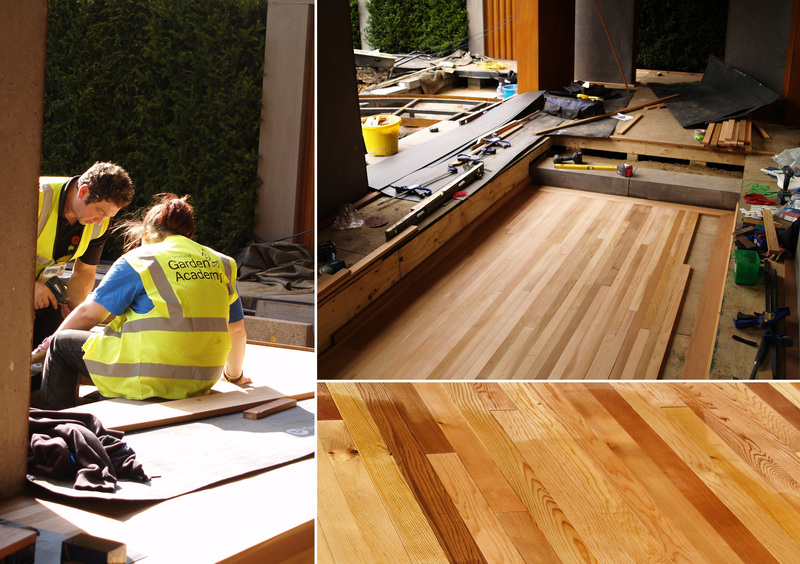 With out a doubt the biggest proportion of my time was spent laying the cedar flooring inside the building and on the roof garden. Having no carpentry experience whatsoever, it was quite possibly the most irritating and addictive thing I’ve ever had to learn to do. There were times when I could not stand the site of it. Cedar, being a soft wood that damages easily, does not respond well to heavy-handedness and frustration when things aren’t going smoothly. Although, it was hugely satisfying to see how adding the wood changed the building and made it look complete. I have to admit that after a couple of days I was aching terribly and Thursday was a particularly bad day. 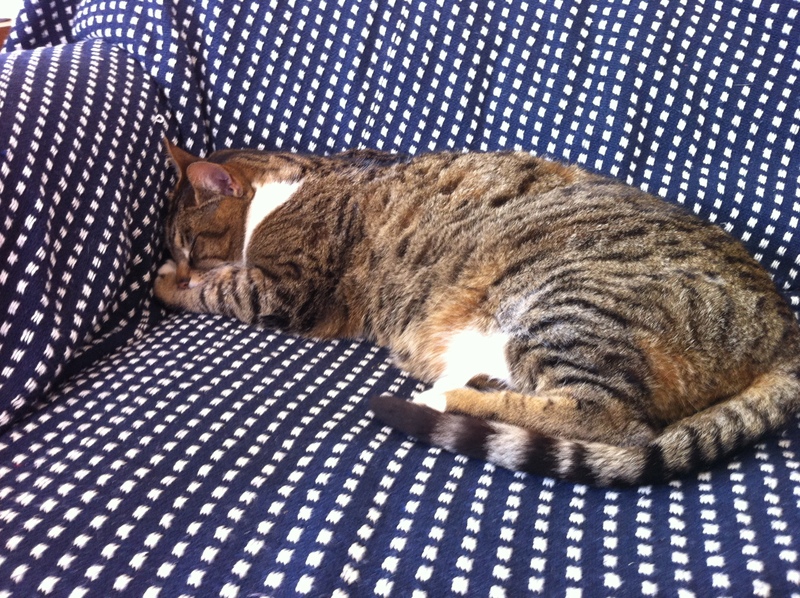 That evening I genuinely was not sure how I was going to find the energy to get out of bed the next day. However, it is amazing what copious amounts of tea, bacon butties and biscuits can do to keep morale high. Plus the rest of the Academy were absolute gems to try and keep me going. 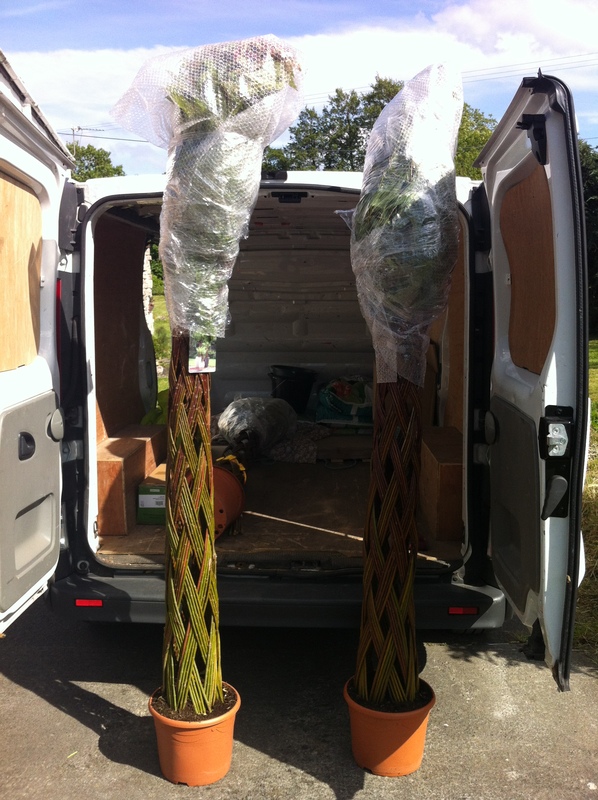 By the end of the week the plants had started to arrive. It was a refreshing reprieve to spend some time moving them around and to soak up all the different plants that were going to go into the garden. 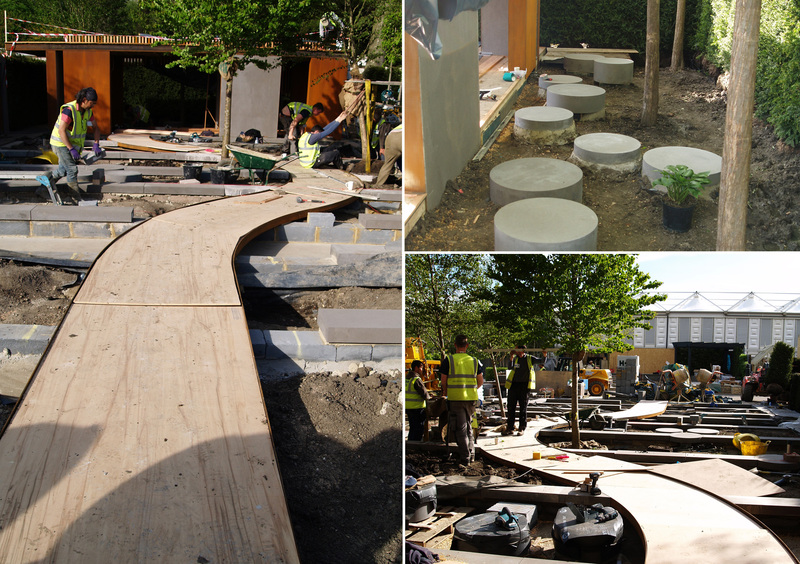 I am really looking forward to seeing the different flowers and foliage against the manmade materials in the garden, particularly the concrete and cor-ten steel. I was also lucky enough to spend most of a day with Jim Buttress, judge from the BBC’s Great Allotment Challenge, who will be helping with the planting. He is a fountain of knowledge about anything plant-related and it was fascinating to hear about his career in horticulture. The atmosphere on the garden was really friendly and positive, especially if the kettle was boiling. The professionals who were guiding us could not have been more helpful, and patient too. Everyday when we travelled back to our hotel, we would talk about how much admiration we have for them. 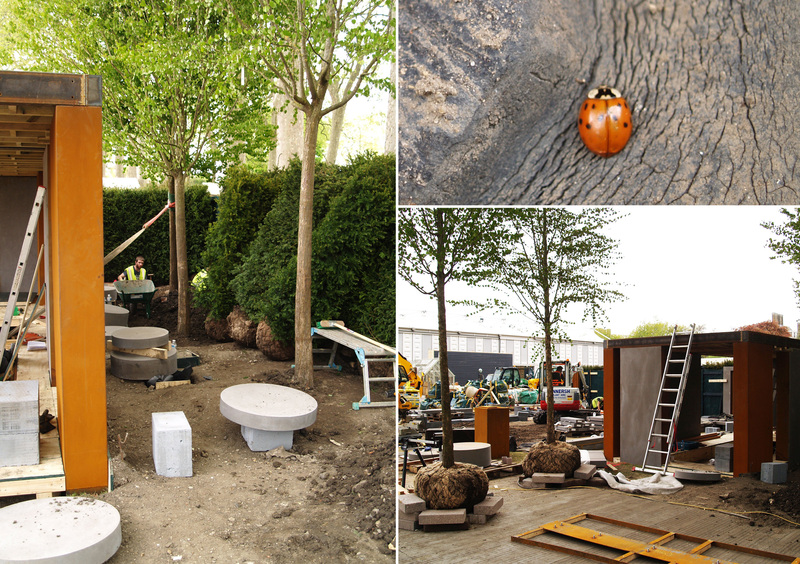 It is an unbelievable amount of hard work and effort to create a garden that will exist at Chelsea for less than a week. 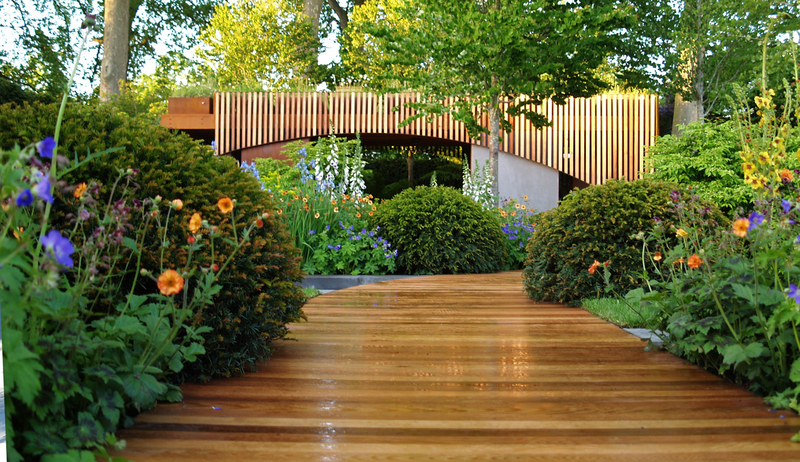 Initially I had put my name down to do just the planting, although I am so glad that I decided to do the build instead. 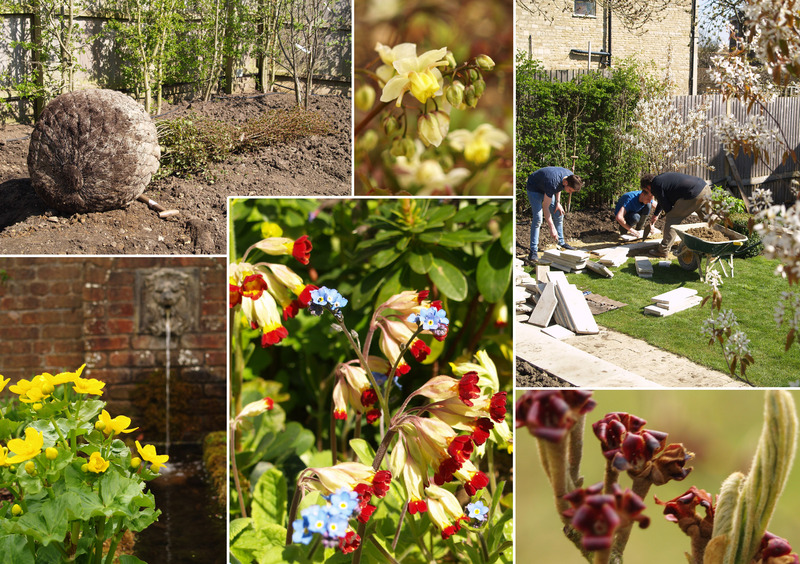 I revelled in being one of the few women on site and feel like I can really appreciate the garden because I have seen it whilst the most dramatic changes were occurring. I was genuinely sad to leave the garden on Saturday evening and decided that after a couple of days rest I would have to go back again to help with the planting. We all knew that Chelsea was going to be an amazing experience, but I think it is exceeding all of our expectations. A few days late, however here is an update of what we have been doing recently.